I'm so glad March is finally here. Even though the ground is still covered with snow, just the thought of March makes me feel like spring might be right around the corner. Here's what is going on in my life as we start this new month. Loving: I hate strongly dislike our research report unit so I'm definitely super glad that it is over and done for another year. It always seems so hard for the students and that makes it stressful for me! Wanting: Since I am so eager for spring, I am also ready for all the snow to disappear. Unfortunately it is still about 3 feet high in my backyard so it's probably not going anywhere any time soon. Needing: I got some amazing products during the latest TPT sale. So now I need to print and file them all so that they are easily accessible when I am ready to use them. Spring Break Plans: My school actually doesn't have Spring Break until the middle of April, but I can plan early right? I don't have any major plans, but by that point in the school year it is nice to just spend the week relaxing at home. 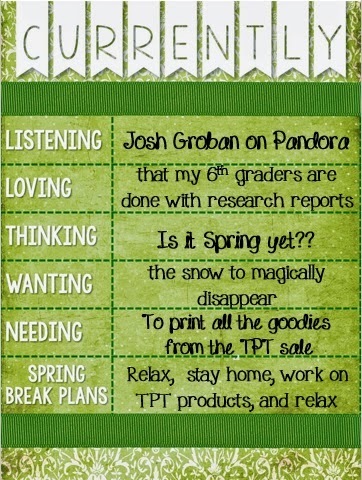 I am hoping to use that extra time to create several TPT products that are just ideas right now! That's my Currently, but we would love to have you hop over to Oh Boy, Fourth Grade and find out what other great teachers have going on this month. Thankfully we haven't had snow here near the coast of SC but we have had some major COLD days. I am ready for some spring like weather too! Wow, 3 feet?! We just started getting the snow a few weeks ago, but I'm right there with you. I hate the cold, and all the snow on the ground is driving me crazy (although we're more like 1-4 inches left). BUT we have snow in the forecast for Wednesday night. Ugh! I will be so ready for our break in April! I can't wait for Spring either? I'm so tired of this snow... and we have more to come this week! !